Fitted with a sapphire crystal caseback engraved "The First And Only Watch Worn On The Moon”, reference 3576.50.00 is most notably fitted with a moonphase and date complication. Its appearance is directly inspired by the vintage reference 345.0809, which was the first Speedmaster to be produced with a date and moonphase complication. This timepiece is offered with no reserve and is presented in virtually like-new condition. The watch must have been worn once or twice only and displays all its original factory finishes. The Speedmaster is unequivocally Omega’s most historically important model to date. 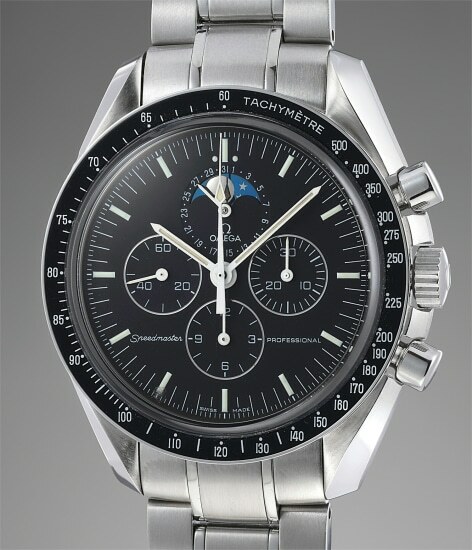 Its history spans almost sixty years with the very first Speedmaster launched in 1957. Period advertising marketed the innovative model to "men who reckon time in seconds". It was incredibly useful for race car drivers, engineers, and professionals who dealt with time in their line of work. This model is among Omega's most important references ever created, spawning successors that partook in humankind's most ground-breaking moments, the most pertinent being landing on the moon.